All teenagers use social media in the exact same way, surely? I mean, it’s all LOLs, YOLOs and WTFs, irrespective of the platform or who they’re connecting with. Right? Maybe not, according to new research, which has found that older teens use different social channels to connect with different people. The survey also concluded that Facebook has faded in importance for most teens because it’s become the place where they have to connect with their parents. Of course, back in the day, Facebook was the place for teenagers to hang out, but times change. Now, they’d much rather be on Snapchat or WhatsApp engaging with their friends, largely because it affords them a level of privacy that Facebook doesn’t allow. Moreover, not only do their parents not use Snapchat and WhatsApp, they haven’t even heard of them. Which is the perfect amount of, uh, perfect for kids. Quite. Twitter is also used to connect with their wider circle of friends, with Instagram falling somewhere down the middle. 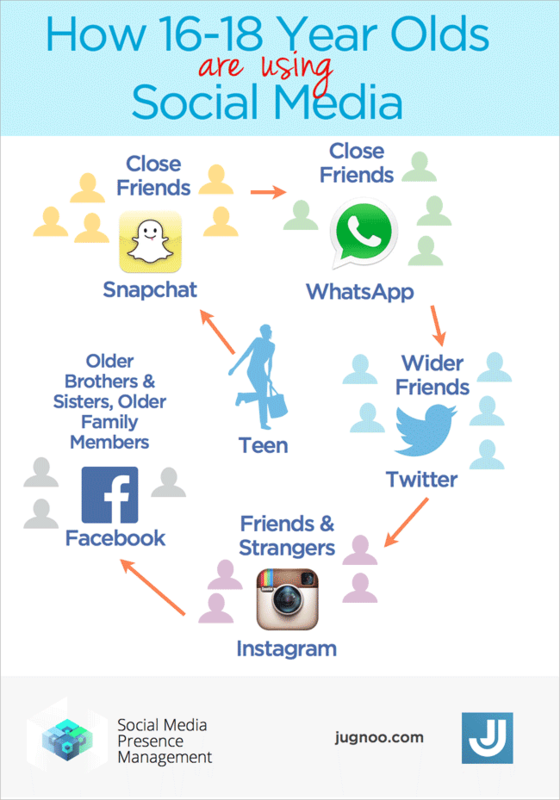 This visual from Jugnoo takes a quick look at how older teens are using social media.